Te Manaaki Villa is situated in the historic town of Russell with stunning views of the bay. It is an attractively appointed sunny and spacious unit set in its own grounds with a private driveway entrance, sundeck and BBQ area. Russell's waterfront, ferry wharf, shops, cafes and restaurants are only a few minutes' walk away. There is a hair dryer in the en-suite bathroom for guest use. The villa is ideal for a couple's quiet holiday. Whilst it is set up with a kingsize bed, couples with a baby are welcome. A portacot is available on request along with a baby bath. There are facilities for small scale self-catering, an electric fry pan, and electric sandwich maker, but for those who prefer to eat out, cafes and restaurants are a short walk away. 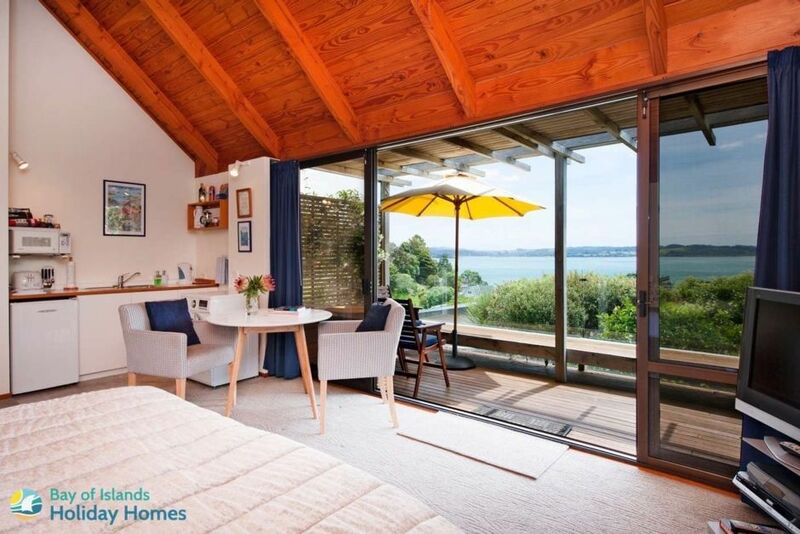 Explore all that the Bay of Islands has to offer, watch SKY TV, access the complimentary Wifi, or just sit and soak up the view. The historic Christ Church is nearby making the villa an ideal accommodation for wedding party members or guests. Explore the Bay of Islands or just sit and admire the view. Thanks very much for your lovely review, we are pleased that you enjoyed the cottage and our beautiful village, you are welcome back anytime, take care - thanks again. Was perfect for our short stay in Russell. Was perfect for our short stay in Russell. Great location. Lovely view. Bed superb. Lack of stove drawback for extended stay. Excellent studio in perfect location. Excellent studio in perfect location. Peaceful yet handy to all amenities. Great view. A hot plate or stove top would be a welcome addition for most travelers. A hot plate or stove top would be a welcome addition for most travelers. The BBQ is a good one though. We really enjoyed our stay here. It is in an excellent location, great view, yet very close to seafront. Very clean property, well furnished and professionally managed. Would definately return.